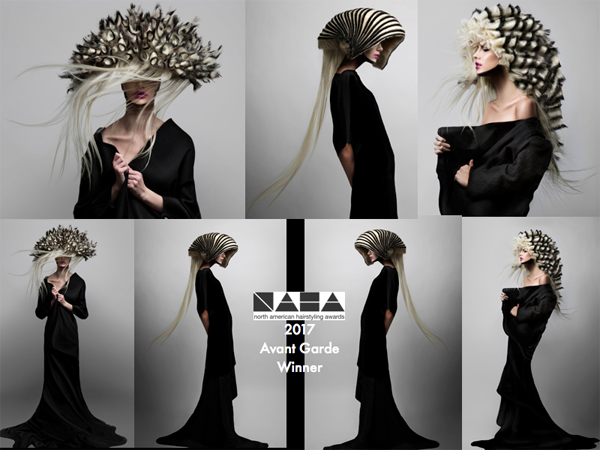 Posts Tagged "Avant Garde Winner"
Home » Posts Tagged "Avant Garde Winner"
Congratulations to the Avant Garde Winner at NAHA 2017 – Chelsea James of the Forma Salon in Engelwood, CO. And congratulations to all the winners. And all nominated. I judged the award winners for the third time this year and must admit it was hard to choose in some of the categories, which included this one. The Winner in the Avant-Garde category for the North American Hairdressing Awards (NAHA) for 2016 was Edward Woody, CEO/President of Folicle Salon in Charlotte and an educator for Keune Academy, a self-described “hair aficionado in every sense of the word.” Here is one of his winning futuristic headpieces, perched on top of a bald white head and white body wearing only painted-on black designs, all as avant-garde as you can get.